Better late than never: President Donald Trump and Mexico’s President Enrique Pena Nieto sat down Friday for their first face-to-face meeting since Trump took office with plans for a border wall still looming and Trump asserting that he’ll “absolutely” send the bill to Mexico. Enrique Pena Nieto was scheduled to be among Trump’s first international White House guests but abruptly canceled the visit after Trump moved forward with plans to construct a border wall along the U.S.-Mexican border and have Mexico pay for construction. Trump insists that the wall is crucial to keeping drugs and criminals out of the U.S. – although those plans still remain unclear. Trump recently suggested that his wall would pay for itself if it were made of solar panels. Pena Nieto, for his part, maintains that Mexico will not pay for the wall. During his campaign, the president vowed to build an impenetrable wall along the length of the U.S.-Mexican border out of concrete and steel. But since his inauguration, he has faced resistance, with Congress unwilling to finance the plan. Trump, who met with Pena Nieto during the campaign last year, insists that even if U.S. taxpayers have to cover the costs upfront, Mexico will eventually be forced to reimburse the U.S. in some way. The strong reaction from Pena Nieto signaled a remarkable souring of relations between Washington and one of its most important international partners just days into the new administration. Since then, Secretary of State Rex Tillerson, Homeland Security Secretary John Kelly and Trump’s son-in-law and top adviser, Jared Kushner, have worked to salvage the relationship. As he kicked off his bid for the White House, Trump had derided Mexico as a source of rapists and murderers coming into the United States. The Trump administration formally told Congress in May that it intends to renegotiate NAFTA with Canada and Mexico. The White House had previously spread the word that Trump was ready to pull out of the pact enitrely, but then Trump reversed course and said he would seek a better deal first. “We’ll see how it all turns out,” he added. NAFTA took effect in 1994 and triggered a big increase in trade among the three countries. American farmers have mostly benefited from the reduction in trade barriers but the pact did encourage American manufacturers to relocate some operations to Mexico to take advantage of cheaper labor there. Critics blame NAFTA for wiping out U.S. factory jobs. The White House said in a statement Friday that Trump and Pena Nieto discussed ways “to help workers in both countries” as part of the NAFTA renegotiation. The statement says leaders also discussed regional challenges, including drug trafficking, illegal migration, and the crisis in Venezuela. It didn’t say whether they discussed Trump’s plans to build a border wall. 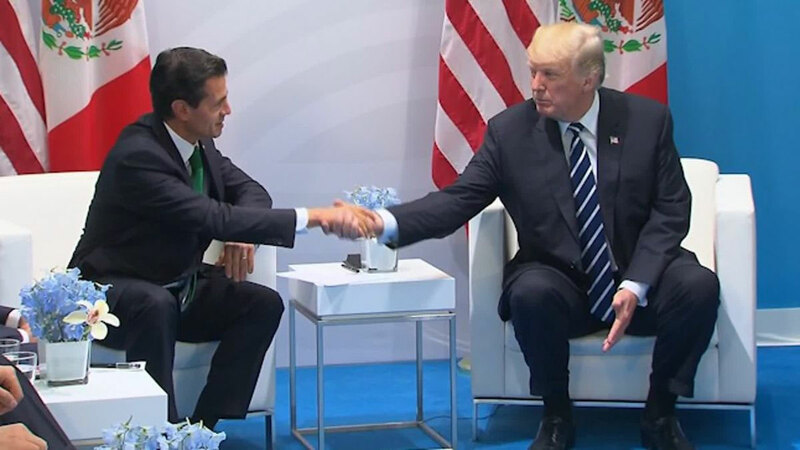 Trump and Mexican President Meet at G20 Summit. Asked Friday if he still expects Mexico to finance the wall, Trump replied “Absolutely.” Pena Nieto said no.